While owning a car is a dream come true for many, there are an equal amount of people for whom buying, and owning a car can become a nightmarish experience. Dealers and insurance agents cash in on a buyer’s vulnerability and desperation to make a quick extra buck by luring the buyer to pay for more than what he had asked for. Every year, several new vehicle owners get caught in the sticky web of Auto Warranty Scams. It’s only natural for a buyer to be nervous about being ripped off. Not all agents or dealers are necessarily the bad guys, but it can be quite a task to find the really honest ones in the lot. Scammers have been known to send out notices in bulk to vehicle owners that are disguised to look like legitimate notices from automobile manufacturers. These notices state the expiration of the existing auto warranty and offer an extended warranty. The marketers aren’t actually providing a typical coverage. In reality they’re selling these policies for the companies that actually do. In all transparencies, these need not even be real policies, but are in fact service contracts that promise to pay for repairs. Be cautious and use your discretion if you have received such a letter or if you are ever to receive one. If you do receive a notice, letter, or email of this sort, the first thing you need to check is if your warranty has expired or is close to expiration. If it is, it would only be wise to cross check the ‘policy’ with your vehicle manufacturer; and if it isn’t, know that you’ve been thrown bait. Customers succumb to pressure very quickly if a salesperson takes his job more seriously than he should. It works well for the salesman to have made a sale, but needn’t always work well for the customer. Under circumstances of anxiety and pressure, many vehicle owners often sign up for a policy without taking the time to read the fine print. Agreeing to any contract without having completely read and understood the terms and conditions can prove to be disastrous. Never agree to a contract without going through the fine print, no matter how long the company says you have to change your decision. Third party service contracts are known for excluding repairs for whatever the provider understands to be an inherent condition, from the terms and condition. Companies that deal in providing Extended Warranty alone go out of business pretty soon, either due to poor management or unethical business practices. If your extended warranty provider was to go out of business, you would lose all the cover that you had paid for. Ideally, you should only buy extended warranty from the manufacturer or from reputed and reliable independent providers. Owing to the intricate nature of warranty terms and conditions that for many can be quite confusing, many agents play about with the numbers in the contract. This can only be avoided by having a fair idea of how warranties work and the common jargon used in order to prevent this scam. A very simple strategy insurers adopt to dupe new buyers into believing that they’ve just availed the deal of their lives is by over inflating the price of a warranty and then offer what looks like a reasonably large discount. A large “discount” works like an effective bait in luring customers to believe that they have been offered a very special policy. Such scams are often guised under names such as “seasonal discount”, “year-end offers”, “father’s day special” and so on. Reputable insurers and major financiers do not generally offer discounts on warranties, so these special discounts should trigger alarm bells and warn you from making a blind purchase. 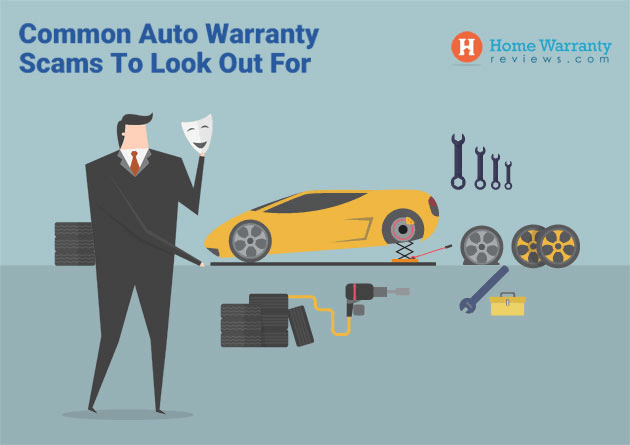 If a buyer insists that a warranty is required in order to obtain financing for the car, the dealer is probably trying to slip in an overpriced warranty to make a good cut for themselves. Enforcing a warranty as a prerequisite for auto financing is untrue and illegal. Warranties although recommended heavily, can even be purchased after the financing plan is agreed upon. Dealers may offer what seems like a very economically priced warranty policy, in a bid to close the deal on a policy. Extremely low priced warranty policies are just as dubious as extremely high priced auto warranties. In such a situation, the salesman relies on the expectation that the customer will not look at what the policy actually covers, but be convinced that they are getting a policy at a very affordable rate. The dealers and salespersons being accustomed to making convincing sales pitches will even be able to successfully convince the customers into believing that they are being sold a complete plan. Asking your dealer whether you qualify for a higher level of coverage generally works as a good way to detect the scam. The ‘As seen on television’ policies with celebrities endorsing a policy are clever marketing strategies by companies to project credibility. Not necessarily a scam but more of an attempt to appear respectable and popular, these strategies are not intended on safeguarding the best interests of the buyer, rather, just a way to make a deal appear more promising. Top insurance providers do not have television spots or celebrity endorsements. If a policy seen on the television seems very attractive, ensure that all the impressive offers are stated in the policy document. More often than not, the policy will not be as seen on television. If a dealer is offering you a bumper-to-bumper policy, insist on reading the policy document. What is sold as a bumper-to-bumper policy generally covers so many parts that listing them all out is impractical. Therefore, the dealer will only list out parts that aren’t covered by or are excluded from the warranty. Hence the name ‘exclusionary’ policy. Exclusionary policies aren’t scams in themselves, but it must be scrutinized for fallacies. If the warranty policy in its list of exclusions lists parts that are actually coverable, you are being sold much less than what you will be paying for. Reading the policy document is the only way to figure if what you’re being sold is worth the price you’re paying. Know that you are being conned if the dealer does not provide the policy document for you to read; reputed companies with good experience in the trade will always show the warranty document first before making their pitch. If you are worried about being scammed, then you should get a free auto warranty quote to determine the best one for you. Prev Post:How To Clean Oven Racks? Next Post:Are Home Warranties Worth It?